(Newser) – Whitney Roberts Logan hasn't felt quite as "merry" this season as she did when she wrote that one word on her Christmas card last year. With the number of Syrians killed in that nation's civil war estimated at near half a million, as PBS reported earlier this year, and on the heels of a divisive election during which Donald Trump's son likened Syrian refugees to Skittles, the Kansas mom says she felt compelled to do something different, reports the Houston Chronicle. 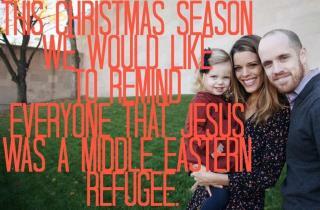 So this year she penned a sentence, and it's gone viral: "This Christmas season we would like to remind everyone that Jesus was a Middle Eastern refugee." This is how far 'political correctness' has gone. This is how far some people will go to appease the muslims in this and other countries. Jesus was the Son of God and he was not any sort of 'refugee', middle eastern, or otherwise. Jesus Christ was born a Jew and died as one. Anyone who cannot admit that and continues to deny it, does not, nor ever have known Christ. This woman is simply delusional. A true refugee is a person fleeting certain death. Yes, they do exist, but I strongly believe they are not nearly as numerous as is claimed. When it comes to our country, I cannot help but notice the majority of people claiming to be "refugees" merely "want more". You see, there once was a famous movie made in 1948 called "Key Largo". It starred my personal favorite all-time movie star, whose name was Humphrey Bogart. The movie was basically about how some vicious, brutal thugs had taken over a resort and held the customers hostage. Their boss was a character named Rocco portrayed by another famous movie star of yore named Edward G. Robinson. Whenever I read about current immigration conditions, I think of that movie often, because of one unforgettable scene where Bogart explains to the other hostages that, "Rocco wants more". I never forgot that phrase as I notice how many so-called "refugees" have enough money to pay smugglers to get them into the U.S. They don't look to me like they are fleeing certain death. It only looks to me like they "want more". This is one of the most stupid "news stories" I've read in a long time. Jesus wasn't a refugee. If the woman in the article really believes that then that's just sad. But then again, most of the 20 and 30 somethings of the world today are not much better. Ignorant and they don't even know it.